Q & A with Ricky Gervais!!! Over the past hour, Ricky Gervais did a Q& A on HBO and we managed to get several questions in for the comedic genius to answer. Ricky has a lot of projects coming up with some that are currently on HBO. 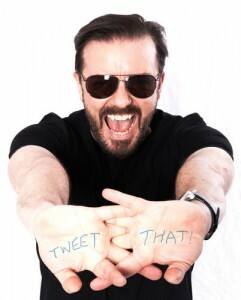 I had no idea Gervais wanted to get whacked on ‘The Sopranos’. Catch his show ‘Life’s Too Short’ on HBO. That’s genius. Below is the full interview. Enjoy. Find Out What You Can Expect on HBO’s ‘Life’s Too Short’ In March!!! This entry was posted on Wednesday, April 4th, 2012 at 2:22 pm	and is filed under News, Television. You can follow any responses to this entry through the RSS 2.0 feed. You can skip to the end and leave a response. Pinging is currently not allowed. « Liam Neeson Keeps On Being a Badass with ‘Non-Stop’!! !